Most rural Kansas towns had at least on bank sometime in their history and the stories often have a lot in common. 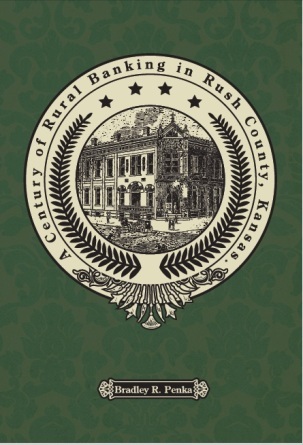 A Century of Rural Banking in Rush County, Kansas tells the story of rural banking using Rush County as a model. It illustrates the evolution of rural banking from the first private real estate offices that offered only rudimentary banking services, to full-service, multi-branch, corporate operations. Over its 125 year history, two dozen banks were operated in Rush County. In the 1980s and early 1990s, the Federal Deposit Insurance Corporation closed over 1600 banks in the United States. During that period, of the nine remaining financial institutions in Rush County, five were closed and three were reorganized giving Rush County the dubious honor of having one of the highest percentages of bank closures in the United States. The book also includes a number of educational “side-bar” features about the banking industry in general. This is a must-read for history buffs, bankers, and students in the financial industry. Important Instructions: Enter the information in the appropriate blanks, then print a hard copy of the form and mail with your payment to the address at the bottom of the form.Sorry, the form cannot be transmitted on-line.